First published in Around the O on January 30th 2019. 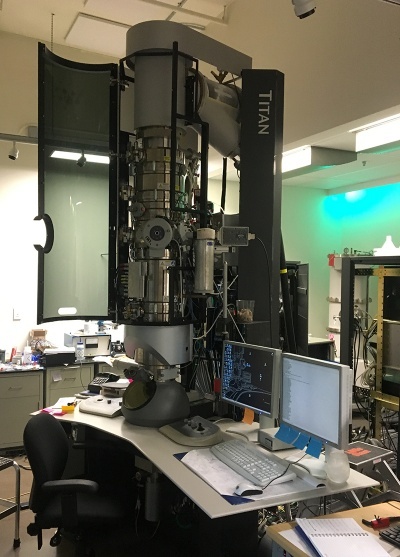 Researchers in Ben McMorran’s University of Oregon physics lab had a great 2018, publishing four papers about their efforts to bring new life to scanning transmission electron microscopes for medical and materials research. They’ve created a technique, STEM holography, that sends electrons along two separate paths, one going through a sample and one not. This allows them to measure the delay between them to create a high-resolution image. It provides improved atomic resolution of a sample’s outer structure and unveils previously unseen interfaces between a sample and underlying material. Researchers in Germany, Japan and the United States theorized 30 years ago that such an approach was possible, but available technology did not allow them to demonstrate it as a practical imaging technique, Yasin said. UO researchers have now shown — using microscopes at the UO, Lawrence Berkeley National Laboratory and Hitachi Ltd. Research and Development Group in Japan — that STEM holography works.